The latest part of the Thunder Pulling filmseries, reports on 90 minutes about the european pulling season. A Flashback on the Austrian Championships: the highlights of the megaevent in Kollerschlag and the top Pulls in Kärnten and Hollabrunn. Then we focused the german championships. Starts with the well known, international event of the Green Monster Team in Füchtorf, with great tractors from England, Denmark, Holland and Italy. Further we go to the south-german Pulls in Seifertshofen and Krumbach with lots of great, actionpacked pulling. Last but not least, one of the European highlights – The Euro Cup in Putten in Holland. Tremendous pulling action on 2 powertracks - also under the lights. The best European tractors are on deck in the divisons Super Stock, Minis,TWD, Pro Stock and Modifieds. Multi V8 engines against V12 Allisons, V12 Griffons and turbines, perform a great show. the strongest MF Pro Stock and the best IHC Alcohol SS ... "Warpath and Controlled Chaos" fly over the track. Interviews and reports of Simply Irresistible, Seaside Affair, Whispering Giant ... and from the US Pullers. 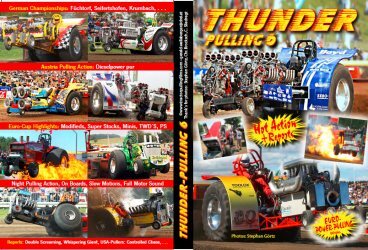 Thunder Pulling 6 offers you lots of great pullingaction with on board footage, slow motions and focus of the best looking machines. It is a must have to your Thunder Pulling collection. Don`t miss it…..